These items must be returned to me within the first week of care. The day care will be open Monday through Friday from 7:30 AM to 5:30 PM. If you are going to arrive earlier than agreed upon, please give me advance notice. For days closed, click here. I have 10 paid vacation days per year. You are required to pay half the regular rate, in advance, for those vacation days. Parents are required to give notification two full weeks in advance when a child is to be withdrawn to accompany parents on vacation. Parents will be required to pay half the regular rate, in advance, for the vacation time in order to ensure readmission. Unlike other businesses, there are no employee benefits for child care homes, such as health insurance, paid sick days, worker’s compensation, retirement/pension plan, employment insurance, annual raises or bonuses. That is why it is very important for me to receive your payments on time and to make my fee policies perfectly clear. 1. Fees cover all meals, toys, supplies and entertainment. 2. Payments are due in advance, on the first day of care (weekly or bi-weekly, whichever you prefer) and are payable by check or cash. If, however, the bank returns two checks, your fee will be accepted in cash only and you will be responsible for any fees assessed to my account. 3. Charges are based on the amount of time you have arranged to leave your child, either full-time or part-time. For example, if you have arranged for full-time childcare, you will be charged full-time, regardless of when you bring your child. You can change your status, in advance, from full-time to part-time, giving at least one weeks notice. In this case, a new contract will be signed. 4. Day Care is closed at 5:30 PM. After 5:35 PM, there will be a $3.00 fee for each additional 5 minutes. If you give prior notification, exceptions may be made. A.	Nutritional meals and snacks will be provided, as well as occasional treats. C.	Breakfast will be at 8:30 AM, lunch will be at 11:30 PM and there will be two to three snacks throughout the day. If your child becomes ill during the day, you will be notified. 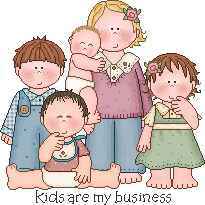 Since I have a relatively small child care business, I am willing to care for your child while your child is sick. Of course if it is an emergency I will inform you that picking up your child is necessary. If your child will be missing day care due to illness, please notify me by phone in the morning or the previous evening. Your child will not be involved in any holiday or birthday related activities in my home. However, your child will be involved in fun activities daily and I will provide occasional treats on “just for fun” days. When appropriate, children will be given short periods of time to calm down. Most people refer to this as “time-out”. This is commonly used for discipline, although it will not be used with your child at your request. In this case we can work together to find the best form of guidance for your child when needed. All children in my care have their diapers changed at approximately the same times during the day, about every 3 hours. If a rash or any other problem occurs in the diaper area, please inform me so that I can be prepared to change your child more frequently. If you have not changed your child’s diaper before he is in my care, please let me know. Please bring extra clothes for your child while he is potty training. If an accident happens, your child will be more comfortable in dry and clean clothes. If you send your daughter in a fancy dress or your son in a nice outfit, there is no guarantee it will stay clean. Children will have more fun when they don’t have to worry about keeping their clothes spotless. Any updates of personal addresses or telephone numbers need to be given to me as soon as possible. Parents have free access to all areas of my house and yard that are used by their children. No smoking is allowed in my home or yard at any time. Parents are free to call at any time to see how their child is doing. An answering machine will be used at times to avoid interruptions, but I will return your call as soon as possible. As a day-care provider, I am required to report any suspected child abuse or neglect. Parents are encouraged to discuss their child with me at any time. Please do not hesitate to contact me about anything that affects the well-being of your child. Please inform me if there are any special circumstances in your child’s life so that I can give your child the extra needed attention. Two weeks notice is required if your child is to be permanently removed from my care. You are required to pay for those last two weeks even if your child is not in my care. If you do not pay for those two weeks, there will be a fee of $10 per day added to the amount owed, until I receive your payment. If you have any questions, email me at: weluvdaycare@mail2emily.com or call 951-302-2270.